Below you can find interesting datamined files from the Live client for the RIFT 3.1: Hotfix #9 patch. Ranged Crossbow. Another file with ref to a crossbow. Air Horse. horse_air_02.ma. Could be internal name for the Great Hound mount. Sylph. Is it a new race? A mob? One of the shapeshifter’s forms? Wings. Wings that are rewarded? About ‘Treasure’. From RIFT China. As such, some of the interesting files mentioned below might be existing or scrapped files that are no longer relevant to the game. A bit of datamining back on the 23rd March showed an EQUIP_RANGED_CROSSBOW and Play_ui_equip_ranged_crossbow in the data files. From memory, there doesn’t seem to be any crossbow weapons in the game. Unfortunately no ‘model/rig’ to show. Okay, we have pistols and rifles. I guess some are held in one hand (1h_gun) and others are held with two hands (2h_gun). The most interesting would be the ranged_crossbow_0.ma and crossbow.dds. It might also be attached to a spec, thus the crossbow_spec.dds. Do these files give added support to crossbows coming into the game in the future? Hope so! Also, do any Rogues or Warriors currently hold guns in one hand? (still Ranged weapon, but held in a single hand, not two?). If not, could this suggest a new pistol…dual-wielding ‘gunslinger’-like soul? Perhaps for the 5th Calling? Another interesting file – this time for a mount. “Horse_air_02.ma” which suggests there’s more than one. The 21st-23rd lines also suggests there’s another Air Horse Mount since “02” uses textures from “01”. Textures include mistwalker and ice shield vfx. So probably a mount with a bit of fog (from mistwalker) at the very least. The file could just be relating to an existing mount, like the Swift Soulbound Charger (since it has fog vfx on its hoofs), but it could also be a new mount. My guess? It might be what the Great Hound mounts are referred to in the files. The Great Hound mounts do have an ‘air’-like quality to some of their features (although the two hounds on the right have patterns that seem inspired by Koi/fish). 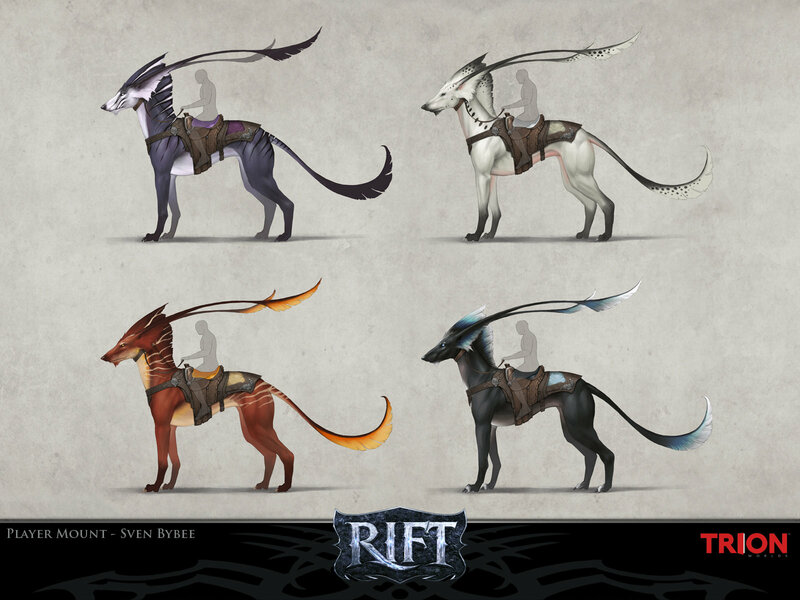 RIFT Concept Art Hound Mount. More recent Concept Art here. Sylph. If that’s got you worried, don’t worry, it isn’t Trion’s attempt at a sexier Glyph client. Sylph is actually a “mythological spirit of the air” [r]. Data files showed a “character/player/sylph_female/rig/sylph_female.ma”. Is this a new race? Or perhaps a new mob? I did a couple searches on Google and the RIFT Forums to see if anyone has ever mentioned a ‘Sylph’ before, but besides an old username there’s absolutely no mention of ‘Sylph’. Does that mean this is new? It could also be a disguise. At this point it seems most likely to be either a new mob (that is under the ‘player’ folder) or a race that was scrapped long before RIFT went into public testing. Pure speculation, but there’s another possibility based on the 5th calling ‘Primalist’. Datamining showed a ‘CLASS_SHAPESHIFTER’ before that could potentially end up as a soul for the Primalist. Could one of the Shapeshifter’s forms be a Sylph? It would make the “player” folder more understandable since the player would be controlling this creature. Not only that but it bypasses the resource issue with having a new race – if it’s just a ‘form’ for a soul, you don’t need to re-create all existing armor and put up all kinds of hairstyles and weapons to fit this new character. All you need is the base model and some new animations to fit with the soul’s abilities. It would basically be similar to adding a new combat pet or combat pet skin. As for variety; Trion could just tap into their combat pet skin system so players could have a handful of ‘styles’ to choose from when they are in the Sylph form. That said, nobody expected Trion to announce that they were adding in a 5th Calling this year. So, maybe a new Race isn’t too farfetched. A “wing_100_export” and “wing_101_export” was found in recent data files on the Live client! The rig moves as you’d expect from animated wings. The most interesting part of these wings besides being under “character/player/human_male” is that it’s under a “reward” folder. And then it clicked. Just today Gingers mentioned in her 3.2 Wardrobe Update article that some time after 3.2, we’d be getting Set Collections and even new achievements related to unlocking sets and dye buckets. Could it be possible that these Wings are achievement rewards for collecting appearance sets? Now, you might have noticed that the “wing_101_export.ma” uses the “hero_vigil_messenger_wings” textures, so that would be the Messengers of the Vigil wings. Does that mean this is simply the wing rigs for the Messengers of the Vigil and other NPCs? That could be the case – but then why would it be under a “reward” folder and under “human_male” when the Messengers of the Vigil use either a human_female model, or their own model? I would have dismissed these files as NPC-related if not for the “reward” folder and “wip_human_male_reward_wing_01” mesh. This provides added impetus that we’re getting Wings at some point in the future – perhaps as wardrobe-only in the Cape slot – and that some of them are gained as a reward, perhaps for achievements. The ‘TREASURE’ line of text found in one of the files from the 23rd March 2015 datamining might actually be referring to an old system that was present in the Chinese version of RIFT. I did some digging and found this screenshot from Gingers’ portfolio. It is a special UI for RIFT China that gave players claimable rewards on a daily basis. The longer you were logged in for, the more rewards you got. So the “TREASURE” doesn’t seem to relate to our versions of RIFT (NA/EU) and since RIFT China is closed, it is no longer available. As to the reason why RIFT China received something like this – it is probably because a lot of Chinese players play MMOs at internet cafes/rooms and I assume that instead of a monthly subscription, they paid by the hour. So will we see this for NA/EU version of RIFT? Unlikely, especially now that we have the Minions system which is kind of like a daily ‘treasure’ system on its own. Plus we have daily/weekly gifts now. A few interesting files with the latest Live update. A bit of an ‘air’ theme going around with crossbows (air-ish), Sylph, Wings and Air Horse models/rigs. Are the Bahmi finally getting their day in the sun? And why not spanish/latin servers? ?